Boeing is scheduled to conduct a series of ground, wind-tunnel and flight tests on new F-15 Silent Eagle (F-15SE) systems as part of South Korea’s F-X III contract. Boeing vice-president for sales Howard Berry said that the wind-tunnel tests on a scale model of the F-15SE will start in March or April. The model used will include weapons bays to assess the aerodynamic performance from various angles for the Silent Eagle’s proposed canted vertical tails. 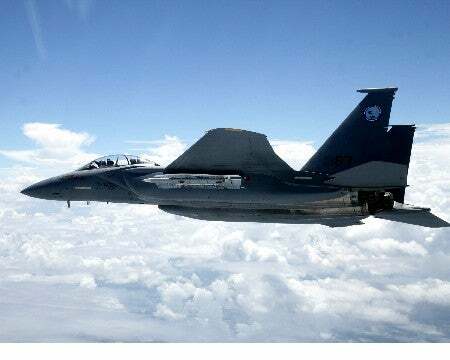 The weapon bays are the modified conformal fuel tanks, which allow the F-15 to store weapons internally and lower the aircraft’s radar profile; the bays themselves have already undergone testing, as reported by Flightglobal. Other key elements of the F-15SE include radar cross-section (RCS) reductions, aerodynamic improvements, as well as advanced avionics enhancements. It is fitted with advanced cockpit systems, a digital electronic warfare system and sensors. Flight testing will be carried out in the fourth quarter of 2012 or early 2013, Berry added. The Silent Eagle was originally designed with tails canted at 15º as a stealth technique, enabling the aircraft to bank up to 15º on either side, without presenting a 90º angle to airborne radars and also to improve the aerodynamic performance of the aircraft. Scheduled tests are aimed to prepare the Silent Eagle to be ready for operations with South Korea from 2016. The nation is likely to release a request for proposals for the F-X III requirements following a contract, which will be awarded in October 2012 for up to 62 aircraft. The Boeing-built F-15E dual-role fighter is the latest version of the Eagle, a Mach 2.5-class twin-engine fighter. Currently, more than 1,500 F-15s are in service with the US, Israel, Japan and Saudi Arabia, including more than 220 F-15E fighters. The fifth-generation combat aircraft, if selected against Eurofighter Typhoon and the Lockheed Martin F-35, will replace the aging South Korean Air Force fighter jet fleet. Image: Boeing to conduct ground, wind-tunnel and flight tests on the new F-15 Silent Eagle (F-15SE) systems for South Korea. Photo: Boeing.